It's been a very busy 12 months full of research, planning and preparation for stage 5 of the run around the world. One thing is for sure, the 2900 mile route from Belgrade to Astana promises to be the most difficult yet on many fronts. The logistics have, at times, appeared to be almost unfathomable. I've lost a lot of sleep wondering how on earth I would be able to make it a success. The first hurdle to overcome, of course, was to attract the required commercial backing to make the venture worthwhile. I wanted enough money to cover the costs of the tour but also a huge chunk of money to benefit the charities. 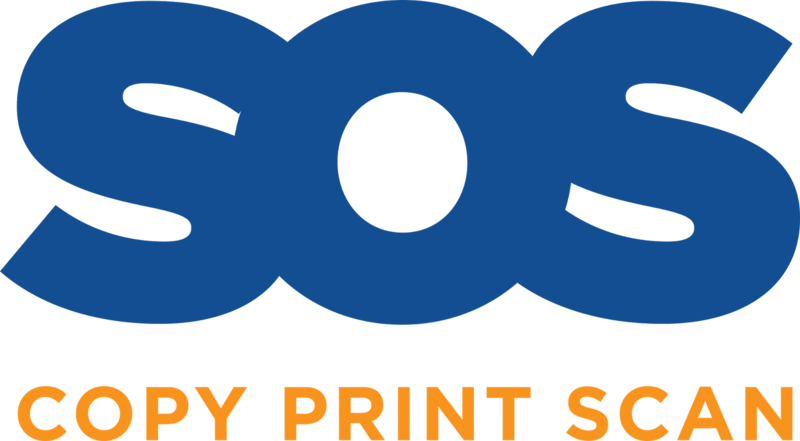 SOS Group didn't hesitate in continuing as main sponsor. Chapman Ventilation, Fresh Freight Group, Active Edge, D-Line, Virgin Money, Northumberland Tea and Brooks were added soon after and Primal Fitness and Performance more recently. Thanks to all of those companies for their kind support. They have all helped to raise almost £25,000 so far in 2017 (£6837.59 for Useful Vision and £17,382.10 for The Children's Foundation). They are going to continue to help me smash my target of £50,000 for this current fundraising campaign which will give an overall total raised of over £320,000. That's some amazing support and generosity. Without the kind sponsors it just wouldn't be possible. The next hurdle was figuring out how to run 1000s of miles without a support team. 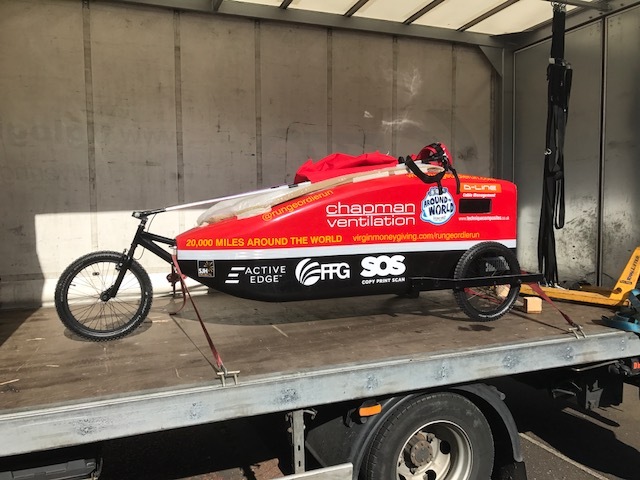 To that end, it is thanks to my sponsor, Chapman Ventilation, that we now have "Chappie" aka the Chapman Ventilation Around The World Buggy. It will be my home for the remaining 11,000 miles around the world. It's a very impressive craft to look at "in the flesh" and reminds me of a life boat or some kind of space capsule. We will certainly be having many adventures and turning a lot of heads together in the year to come. Once Donna and I were happy to proceed with stage 5 it was time to approach a charity to ask for permission to fundraise. 2017 has given me a chance to have a really good think about where I want to concentrate my fundraising efforts going forwards. Of course, this year away from the run around the world, I've really enjoyed raising funds for Useful Vision. At the time of writing, almost £7000 has been raised. 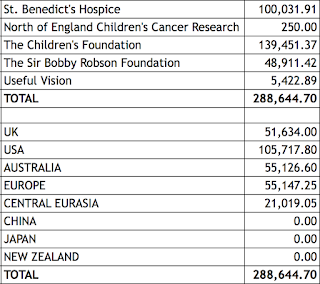 With 6 weeks of the year remaining I'm hopeful of getting the final total close to £8500. I always enjoy visiting their website and Facebook page. It's obvious to me that they put the money raised to great use to support vision impaired children and their families with many different activities. I knew very early this year which charity that I intended to approach for permission to fundraise once Donna and I would eventually sign off stage 5. In fact, it was the 9th of March when I chose St Benedict's Hospice as a potential charity. That is a very significant date for me as you will see below. I wrote the following over 10 years ago. 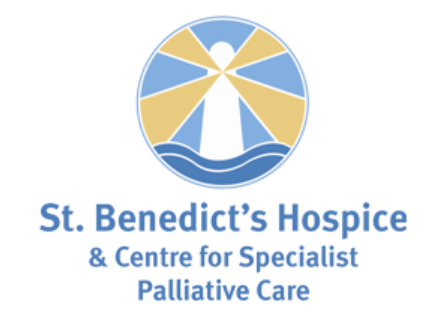 "The staff and services provided by St Benedict's Hospice made my Mam's final days battling cancer more dignified and taught us both how to, what she and I called, "live with cancer". My Mam attended the day care unit at the Hospice on a weekly basis for many months. It was during this time that the assessment and management of her treatment was undertaken by the specialist Hospice staff. 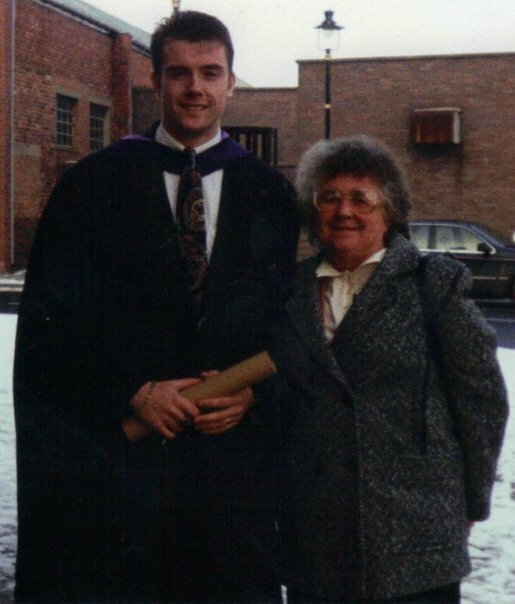 It was certainly a bit of respite and relief for me, knowing my Mam was in good hands for a day receiving the kind of care and attention that I know she really appreciated. She often talked about the staff as if they were a bunch of her good friends. My Mam was admitted to the Hospice on the 27th December 1994. She spent a week there having her medication regulated and trying to get better and returned home with a renewed confidence to battle the cancer that she had and also support me while I did my 3rd year University exams. I passed with flying colours thanks to her support. The 20th February 1995 saw her return to the Hospice. Her condition had worsened and there she stayed until her passing away on the 9th March 1995. I feel I owe St Benedict's Hospice a huge debt of gratitude. If I can help them, in any small way, to continue to provide the kind of services to other terminally ill people in the region, then I will. This isn't just something I intend to do for a short time. I'd like to think I'll always try and raise funds for St Benedict's Hospice. Indeed, 2004 will be the 10th year of fundraising activities. I hope, in years to come, my son Jack will also have a part to play in this. And hopefully the support of my family and friends will continue. It's their money that is going to the Hospice after all." I visited the hospice recently and presented my plans to run from Belgrade through Serbia, Romania, Ukraine, Russia to Astana in Kazakhstan. The visit also gave me a chance to have a look around the new hospice building. It goes without saying that I was very impressed and humbled with what I saw. To my huge relief, permission was granted to fundraise for the hospice in respect of stage 5 of the run around the world. For once, I didn't have a plan B so I'm pleased that I'm able to continue to repay the debt of gratitude that has never gone away. For me personally, it's hard to describe just how good it feels to have a personal connection back to my fundraising. I was very close to both of my parents. To lose them both when I was young was, and still is, a difficult thing to cope with. 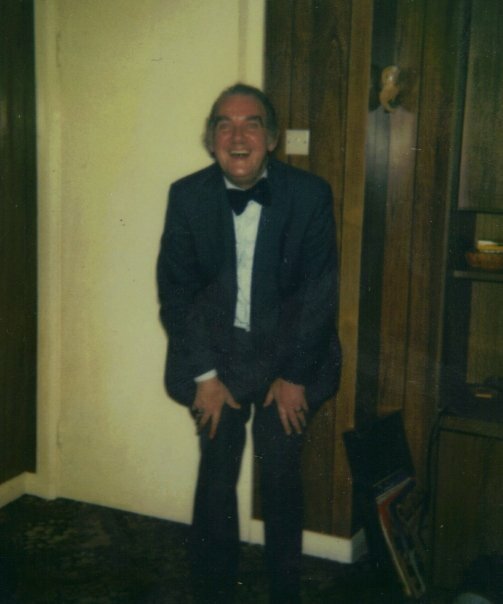 My Dad died in 1988 when I was 17. I was 23 when my Mam died in 1995. I'll be talking a lot more about St Benedict's Hospice over the coming months. For now, I'll close this blog with a part of the speech I gave when I announced my plans to run around the world in 2014. "When my parents were taken from me when I was just a young man I could have done 1 of 2 things. I could have let the grief consume me and tear me apart (I must admit that it nearly did) or I could do something positive and put to good use the debt of gratitude I feel to local charities for at least trying to help my parents and for making their final days battling cancer as comfortable and dignified as possible. Fortunately, I chose the latter option and it has helped to ease the burden of grief that I have carried with me every day since I lost my parents. It is a most terrible dark feeling that is as painful in my heart right now as it was all of those years ago. Thankfully, through fundraising, I have found a way to control and even some days numb the pain. There is no doubt in my mind that raising funds for good causes has been as beneficial to me as it has to them and the beneficiaries of their charitable good deeds. Ladies and gentlemen, I do realise that my story is no different to many other peoples’ in this room today or in the street outside. We have all lost loved ones. It’s what we do, in their memory, for the greater good of others that is so very important.". After spending the last 12 months looking at the many aspects of segment five of the run around the world we (Donna and I) have decided that it will go ahead as planned, starting on the 1st May 2018. The original route that I proposed back in 2014 via Turkey and Georgia into Russia is an absolute non starter for safety reasons. The advice from the UK government regarding the route into Russia between the Black Sea and Caspian Sea is either "advise against all travel" or "advise against all but essential travel". It seems that the the decision made last year, to finish segment four early in Belgrade rather than Istanbul, was a very wise one. As planned, this has given us a chance to get back home, regroup and come up with the safest plan possible for the remaining 11,000 miles around the world. That plan now involves taking a more northerly route. It will take 100 days (91 days x 31 miles and 9 rest days) to run the unsupported 2821 mile route from Belgrade, Serbia through Romania, Ukraine, Russia to Astana Kazakhstan. It doesn't look that far in the images below but it's almost the same width as my route across the USA. We are under no illusions that running and pulling Chappie, aka the Chapman Ventilation Around The World Buggy for such a considerable distance is going to be easy. I'm looking at the positives though, as having a support team isn't always the easiest and happiest experience for me. Also, not having an RV is a relief after the damage that was inflicted on the one we had last year as a result of an unfortunate accident. This time, I'm in full control of the outcome. I'm very excited and in many ways relieved about that. I'll restate, though, that it's going to be very very difficult. I'm also genuinely excited about what I call the "adventure" aspect of the Road to Astana. Cooking for myself, ensuring that I have enough food and water, tending to my feet, finding safe places to "park up" and sleep etc etc. Now let's have this conversation again after 1,500 miles when I'm in the middle of Russia! Let's see just how much I'm "excited" then! I will be sending my plans to my chosen charity next week and will seek the official sign off from them before the end of November. Following that there are two further obstacles to overcome. The first is getting a Russian visa. The second is coming up with a plan to transport Chappie safely to the start line in Serbia to and back from the finish line in Kazakhstan. To say that segment five of the run around the world is going to be the trickiest to complete is an absolute understatement. Just getting to the start line is taking a huge amount of planning. I must thank those kind people who have helped keep my dream of raising at least another £50,000 for local causes alive. 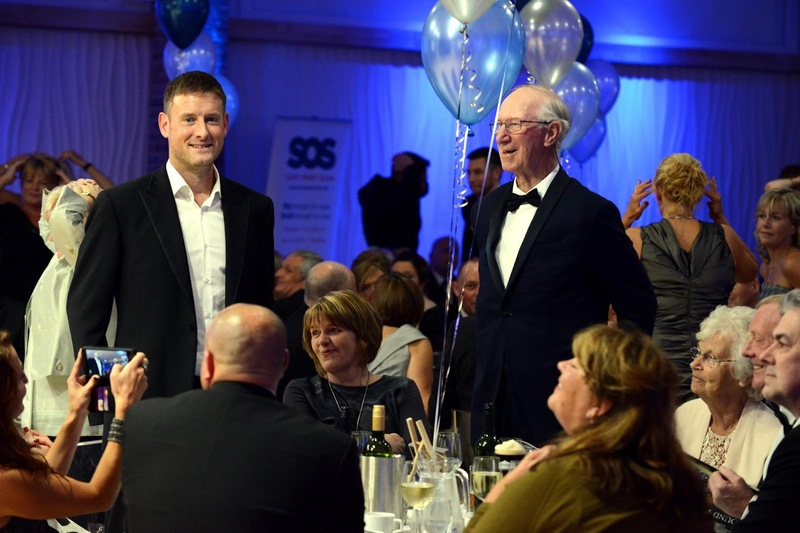 Thank you to my main sponsor SOS Group Ltd, Chapman Ventilation who have paid for the construction of Chappie and also FFG Logistics, Active Edge, D-Line Cable Management, Brooks, Virgin Money UK, Primal Fitness and Performance and Northumberland Tea for their amazing support. Thanks also to James "Jimmy" Childs who is continuing his task of looking at my route in great detail. Thanks also to the many supporters who have made a donation to The Children's Foundation and Useful Vision in 2017. The current fundraising total for 2017 stands at £23,913.70 with an overall total of 291,539.35. Watch this space in the next few weeks for news of the 2018 charity upon successful sign off. During the summer I took the opportunity to take a really good look at what I've been able to achieve from a fundraising point of view so far and what I want to do in the future. 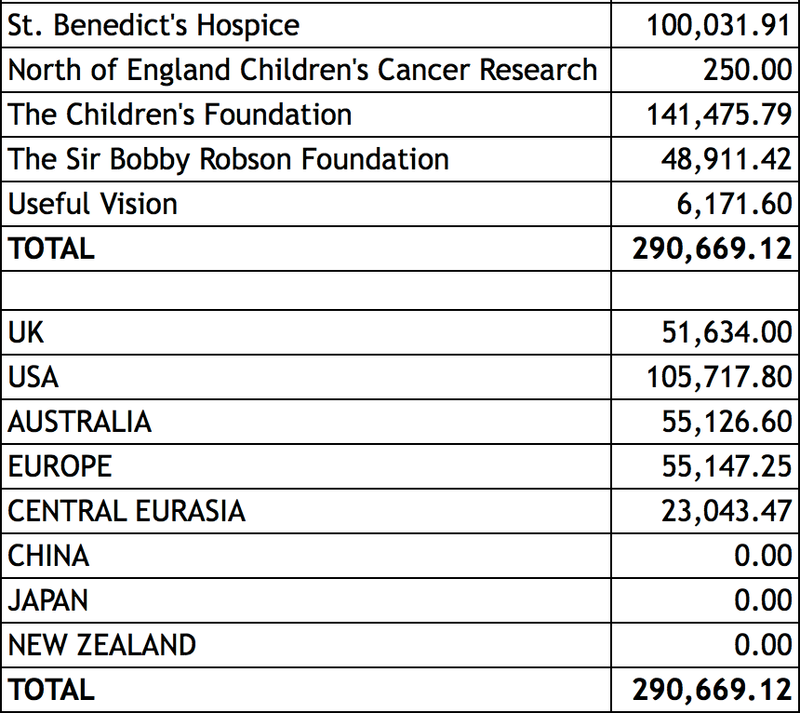 I use the term "I" loosely because of the incredible generosity and support that I've received from so many people to be able to raise (at the time of writing) £290,669.12. So far, £23,043.47 from the grand total of £290,669.12 has been raised in 2017. 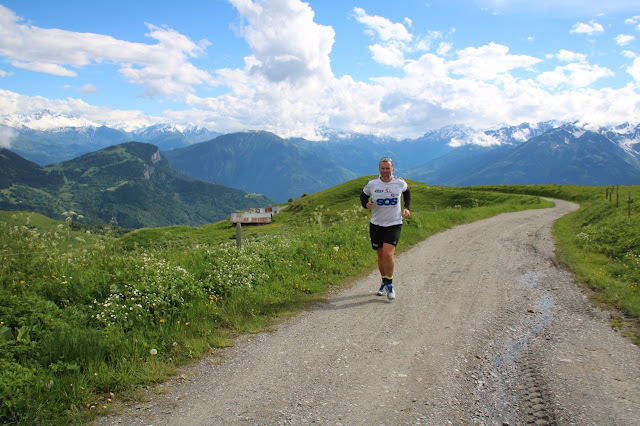 I'm on target to smash my personal fundraising target of £50,000 for this current fundraising campaign which, of course, concludes with segment five of the run around the world; a 2,900 mile run from Belgrade to Astana next year. 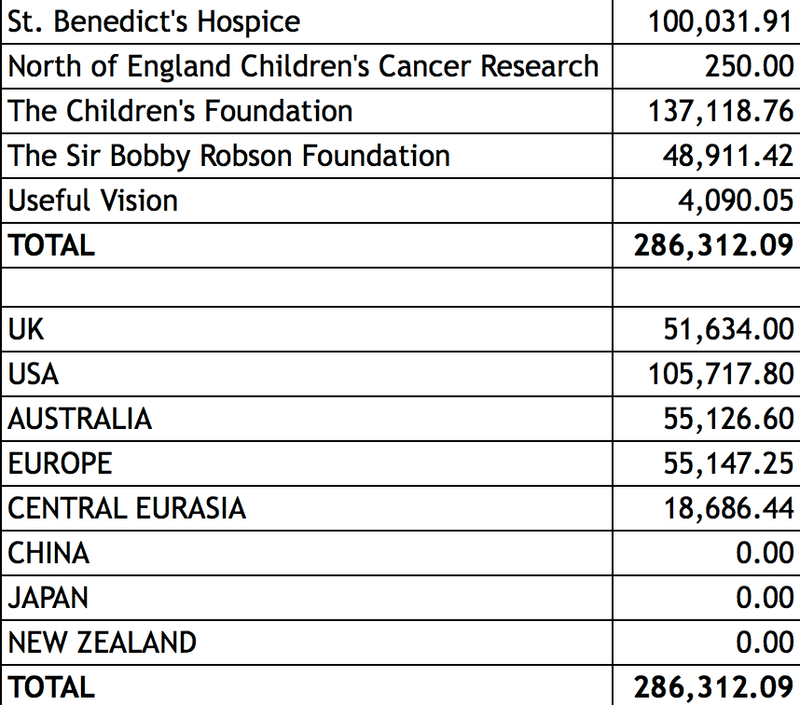 The funds raised to date can be seen below by charity and by fundraising campaign. So that is what has gone on in the past. What about the future? 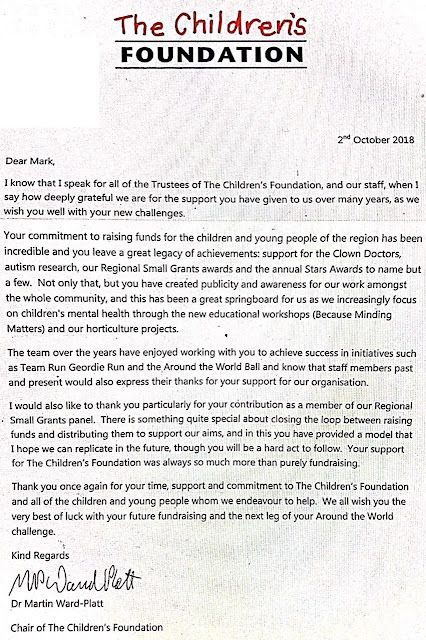 Firstly, during the summer I made the difficult decision to cease fundraising for The Children's Foundation at the end of 2017. It was a decision that wasn't taken lightly but with £141,475.79 raised over the last eight years I think I can depart after a job well done. I've really enjoyed fundraising for the charity and I'd like to thank their staff and Libby Nolan and Peregrine Solly in particular for the advice and support they gave me. 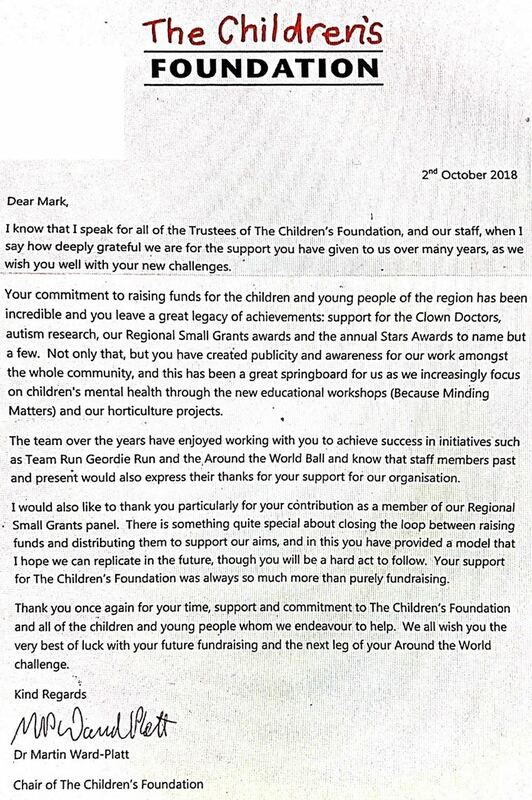 I was very proud to receive the following reply to my "resignation" from The Children's Foundation this month. So that brings a successful end to one particular era of my fundraising. The next very important step is to approach a charity and seek permission to fundraise in respect of stage 5 of the Run Around The World. That will only be done when Donna and I have signed off the run to Astana in a few weeks time. Watch this space during November for news on how that all goes. Planning, research and preparation for stage five of the run around the world is going very well. A great deal of work has been done this year. We are now in the final stages of making sure that we have a plan to make the 2,900 mile run from Belgrade, Serbia through Romania, Ukraine, Russia to Astana in Kazakhstan as safe as it possibly can be. Donna and I will make the decision on whether or not to proceed by the 10th November 2017. We will then look to gain charity endorsement by the 24th November 2017. After that, it's all systems go with just over 150 days until the start in Belgrade. So November is a "make or break" month for the run around the world. We are doing everything that we possibly can. We are talking to the right people, devising the best plans and, as has been the case for the previous 9,000 miles, leaving no stone unturned in terms of planning and preparation. As per usual, I'll keep Twitter, Facebook and this blog updated with any news. As a result of Chapman Ventilation's £1070 donation to Useful Vision, the £20,000 and £21,000 barriers for the current campaign have been broken this week. That's an incredible amount of continued generosity from so many people. Thank you! See the image below to see the exact amounts raised for each charity. I reckon about *cough* £20 *cough* of the current campaign's amount is from me at the Tuck Shop! I've got a lot of scheming and plotting going on behind the scenes and, with a lot of further good luck and generosity, I'm confident of hitting and smashing my own personal target of £50,000 for the current campaign and £317,000 overall by the time I reach Astana in Kazakhstan with #Chappie. The realisation of my fundraising ambitions would not be possible without the incredible support of the general public and the set of sponsors who help to make running around the world possible. None of this would be worthwhile without the charities doing their amazing work. A year ago I decided that the final 11,000 miles around the world would be run unsupported. To take a motorhome and a support team through the remaining countries would be far too expensive. As a charitable venture it just wouldn't have the financial rewards that such an effort warrants. The cost of fuel, insurance and RV hire not to mention the personal cost to the support team to get to the remaining remote locations would be huge. So how do you run 11,000 miles unsupported? I had an initial idea of pulling a cart with all of my supplies inside. It was Jimmy who then discovered a company, SJH Projects, that had made such a thing for an arctic marathon. I made contact with them and, after a visit to the factory in Nottingham to see a prototype, I decided that they were the right people for the job. The only stumbling block to getting the buggy project off the ground was money. That wasn't the case for very long at all and long term supporter, Chapman Ventilation, offered to pay in full for its production. The budget for the project was £20,000 and we agreed that any surplus money from that budget would go to my chosen charity for 2017, Useful Vision. As it turned out, £1070 has ended up being paid to the charity which is fantastic! 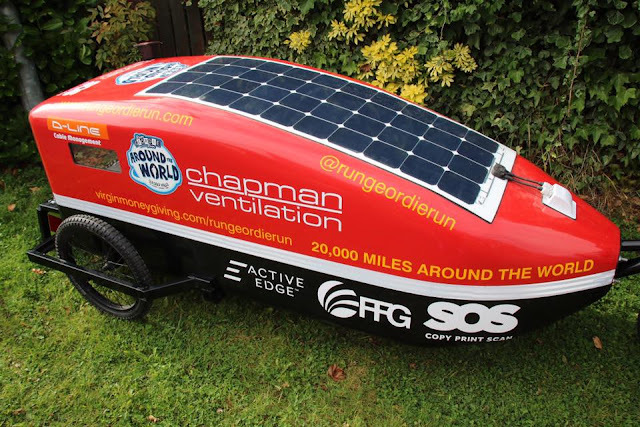 A huge thank you goes to Chapman Ventilation for their continued support. I announced my intentions to go unsupported using a buggy at the Around The World Ball in October 2016. To the amazement/disbelief of those in attendance I showed an image of the prototype buggy on the big screen. I'm not sure how many people took me seriously but I'm glad to report that 12 months later the Chapman Ventilation Around The World Buggy, or "Chappie" for short, is now a reality. 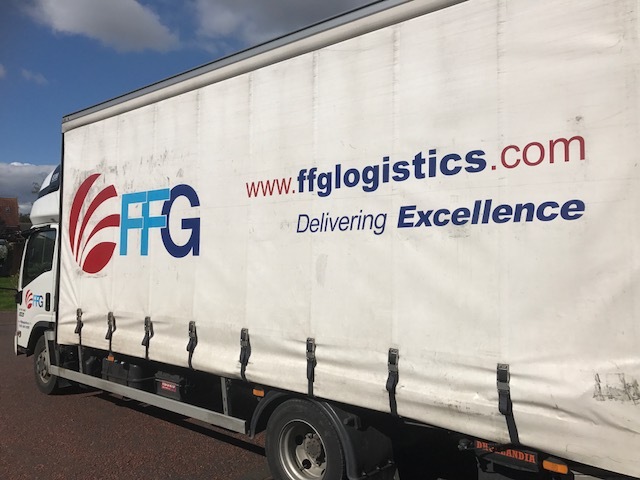 Another of my amazing sponsors, Fresh Freight Group (FFG), kindly transported the finished buggy from Nottingham back to the North East last week. By the way, the t-shirts designed by the children at Useful Vision and paid for by FFG have almost sold out. This is a classic example of making the sponsor's money work hard for the charities. a £645 spend has returned double that amount for Useful Vision. FFG also kindly packaged and posted all t-shirts which has also saved a lot of time and money. Another massive thank you goes to FFG for their brilliant support. Back to the buggy. With a carbon fibre body, steel chassis and 16 inch BMX wheels, Chappie weighs 70kg when empty. 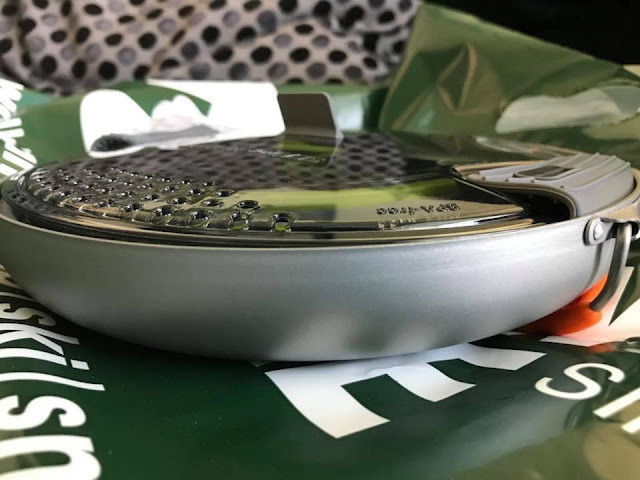 The solar panel on the roof of the buggy is connected to an internal battery which means that I'll be able to power equipment such as my GPS watch, a GPS tracking device, laptop and photographic equipment. I'll sleep in the buggy for the remaining 11,000 miles through Serbia, Romania, Ukraine, Russia, Kazakhstan, China, Japan and New Zealand. 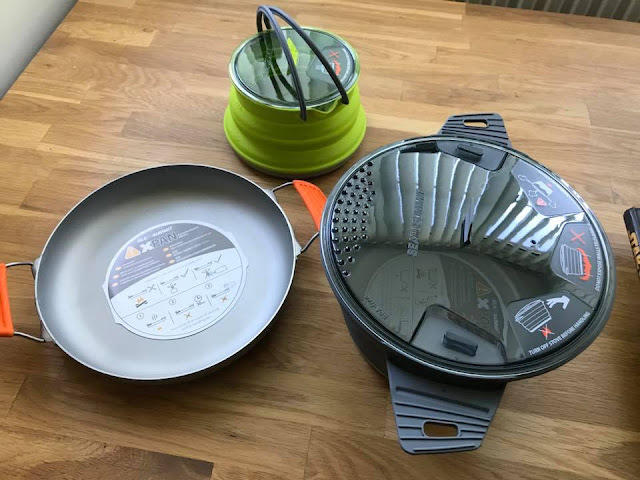 All of the supplies that I need will be inside Chappie including this collapsable set of pans. The first image below is a pot, frying pan and kettle all squashed down. The second image is all three in their full form. I can't wait to see what I can rustle up in those things after a hard day of running. It'll probably mostly be porridge but I reckon I might surprise myself a few times. You'll be hearing a lot more about Chappie in the coming months and also the kit inside that I'll be relying on to help get me from Serbia to Kazakhstan in 2018. In Sunday's blog I mentioned that I'd had a lot of positive discussions with various people recently. The following details the outcome of one of them. Stage five of the run around the world through Serbia, Romania, Ukraine, Russian and Kazakhstan will, of course, be unsupported. That said, there is still need of a support team back in the UK to undertake a variety of roles. I'm slowly finding the right quality of people and the first person to welcome on the team, or rather back to the team, is James Childs. James, or "Jimmy" as he is known on the team, is once again responsible for route planning. He did an absolutely outstanding job with the route across Europe last year (as well as driving the RV from Newcastle to the start line in Lisbon and being on support duty for the first seven days). It was no quick and easy feat making sure that my initial high level route from Lisbon to Istanbul was documented in great detail and checked again, again and again for safety. Jimmy has now been tasked with repeating the exercise for next year's 2,900 mile route from Belgrade to Kazakhstan. Jimmy's previous experience, methodical approach and eye for detail makes him the perfect person for this task. A huge thank you must go to Jimmy for giving up so much of his time for this very important task. 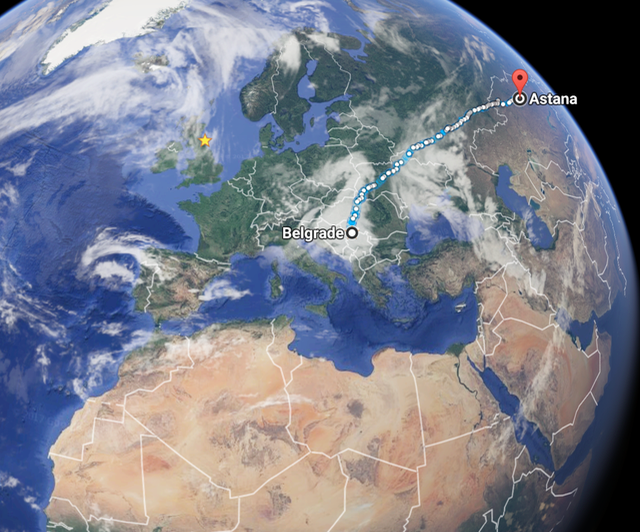 The start of segment five of the run around the world, the 2,900 mile run from Belgrade to Astana, is only 225 days away. There's so much going on behind the scenes to make this particular campaign a success. The following blog are just a few of my thoughts. Firstly, the workings out for Team Run Geordie Run's fundraising for The Children's Foundation at The Great North Run is ongoing. I say ongoing as the money is still coming in. At the time of writing, £14,534.62 has been raised. There's still money to collect and although I would say £16,000 is more than realistic, the final figure could be as high as £17,000 for The Children's Foundation. Watch this space over the coming weeks as we near the final figure. Whatever the total, we have blown last year's total of £10,000 out of the water. I know that the charity will put that money to very good use to benefit children in the north east and everyone on the team should be very proud indeed. I've already started putting together the team for the 2018 Great North Run and the response so far has been brilliant. Please get in touch at sponsorship@rungeordierun.com if you'd like a place. Further hard work and charitable scheming continues in other areas and I think it's nailed on that at least £50,000 will be raised on the next leg of the run around the world. That figure is my own personal target and has been the same for each of the previous four segments. With continued good luck, generosity and support from the general public the amount raised could be a lot more. I'm taking nothing for granted however. I work hard for each pound raised for local causes and I appreciate every penny or pound donated. 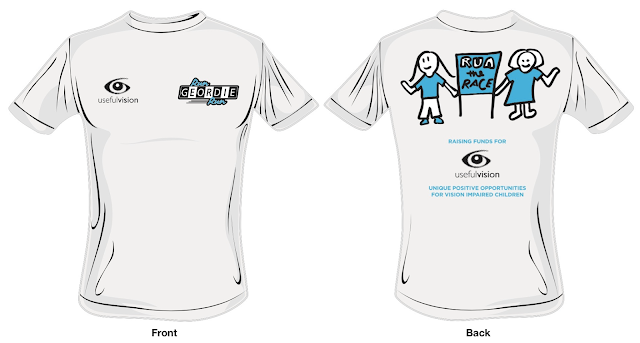 Speaking of donations, the sale of "Run the Race" t-shirts has raised £1200 for Useful Vision so far. There are a handful of cotton t-shirts left and I'm so proud that the design created by the children at Useful Vision has proved to be so popular. Last week, I had a couple of really good discussions with various folk which means that I'm more excited for the next leg of the run around the world as ever before. I'll be sharing news of those meetings over the coming weeks. 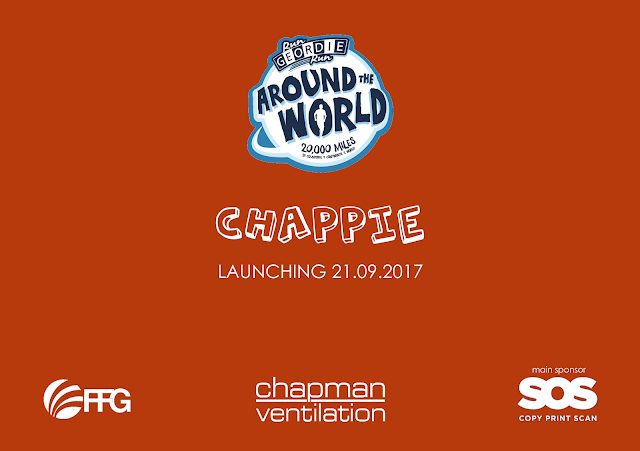 Next week is a very important one as I will finally take delivery of the Chapman Ventilation Around The World Buggy or "Chappie" for short. I'm looking forward to finally being able to share images of it and I'm sure that people are going to be as captivated by it as I am. Chappie was just a pipe dream 12 months ago and, incredibly, it's now a reality. I'm very big on always performing actions to backup my words and delivering on my promises and Chappie is testament to that. That said, a huge thank you must go to Chapman Ventilation who have paid for its production. Without them it just wouldn't have happened and the run around the world would have come to an end. Thanks also to FFG who will be transporting it safely to Newcastle from the factory in Nottingham. Chappie will be my home for the remaining 11,000 miles around the world. I will eat, sleep and shelter in it and, of course, everything I need to survive will be inside it. It will be strapped to my waist while running and I'm under no illusion that pulling it across the remaining countries of the world route is going to be extremely difficult. I'm really looking forward to my first training run with it next Saturday and Sunday. If you see me between Bedlington and Tynemouth Priory please give me a wave. In other news I have started to put together a plan for taking people on the journey in a more engaging way than ever before. I feel that it's something that I got most right using social media and a blog during the run across the USA. 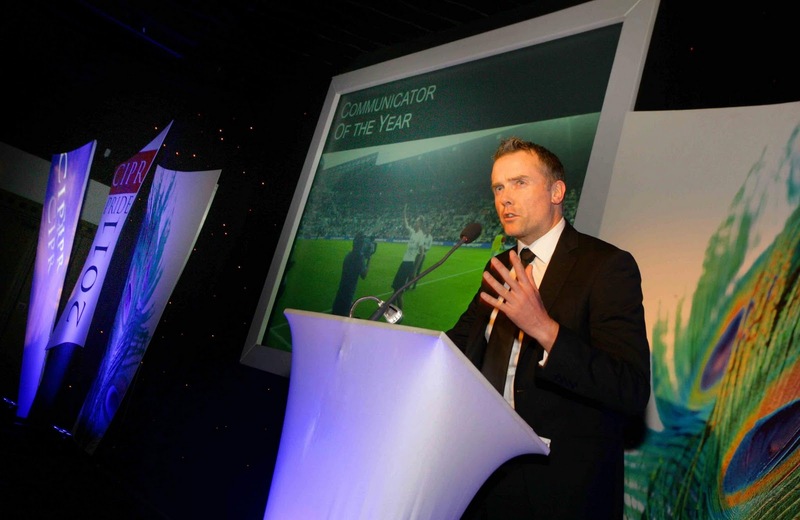 The blog had over half a million hits and backed up with a successful social media campaign I won the Chartered Institute of Public Relations Communicator of the Year. For a few reasons I feel that I never achieved that standard during the run across Australia and Europe. Running 30 - 40 miles per day while taking people virtually with you online is time consuming. Over the coming months, I'll be continuing to work on the plan that I believe will serve the fundraising, the running and the story of the journey best. Despite all of the fundraising and planning, the next segment of the run around the world won't get the go ahead until Donna and I are happy that we have a plan in place that makes the event as safe as it possibly can be. We are on schedule to make that decision some time during November 2017. In the meantime, the research, the discussions with the relevant people and the planning will continue. We are working as hard as we possibly can on this. We are only unqualified volunteers at the end of the day. However, using the experience and knowledge gained during the first 9,000 miles, I'm confident of being able to reach the correct decision in terms of continuing the run around the world. Despite the go ahead of decision being in the balance, planning has started on the fourth Around The World Ball next October. I'm confident of another sold out event. Watch out for details in early 2018 about how to secure your tickets. The latest fundraising position makes for good reading and I'm continuing to work hard to raise at least £10,000 for Useful Vision in 2017. I always enjoy reading what the children at the charity are up to and you can too on their Facebook page. I could go on but I'll leave it there for now. Watch out for further news on the blog, Twitter, Youtube and the Facebook page over the coming weeks. 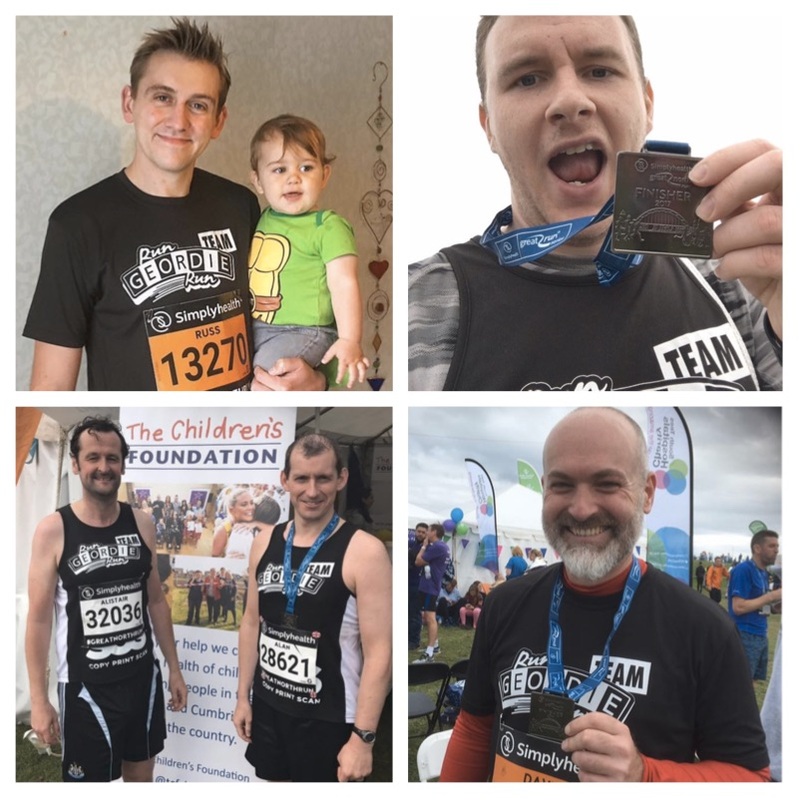 Last year, Team Run Geordie Run raised an amazing £10,000 for The Children's Foundation at the Great North Run. I always felt that the sum raised in 2016 would be a very hard act to follow. How wrong I was! 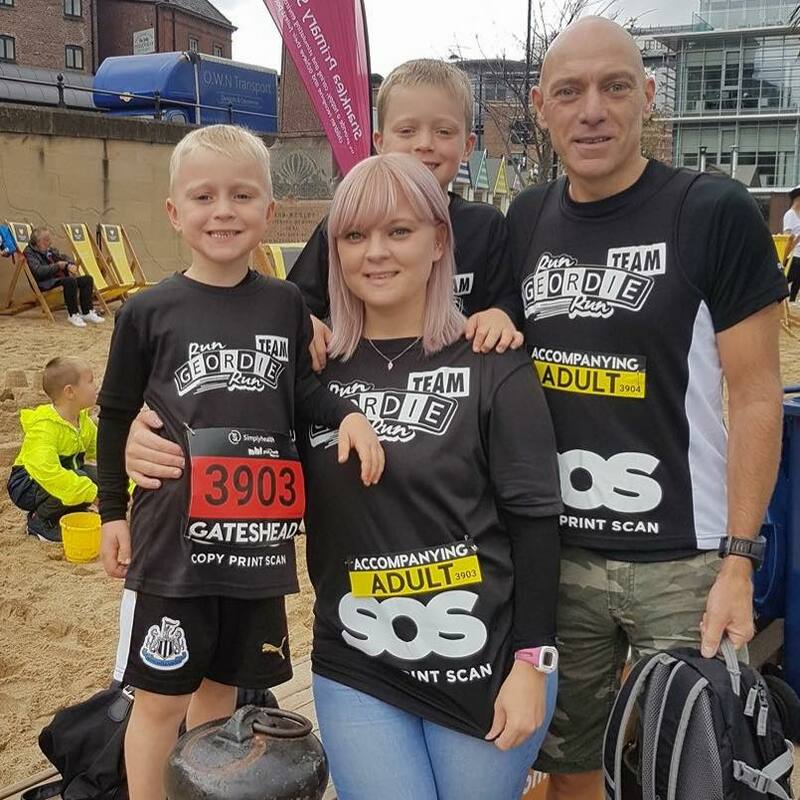 At the start of the 2017 Great North Run weekend we had 24 runners in the main event and two in the mini event. We would have had an even bigger team but unfortunately, six runners had to defer their place through injury. I wish them all a speedy recovery and hopefully they will be able to take part in 2018. Of course three of the team, Simon who is blind together with Jonathan and Michael as his guides, started out as fully fledged Team Run Geordie Run runners when they signed up in January. I saw a real opportunity back then and together we grew and nurtured the Running Blind brand. 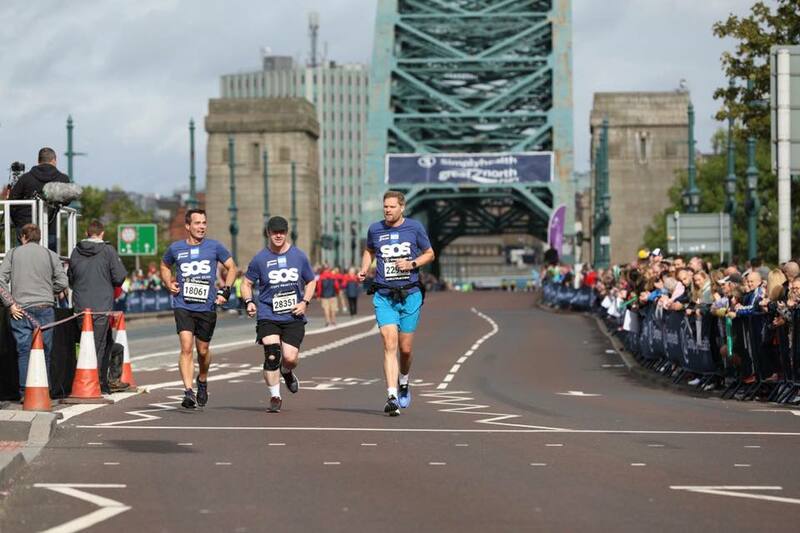 The three lads set off 15 minutes before the main field and the image below shows them just after they crossed the Tyne Bridge. Strangely for them, they were cheered on by thousands of people with no other runners around them for a good five miles. Sir Mo Farah then overtook them followed by the main field. The lads finished the Great North Run in 2 hours and 9 minutes. This certainly exceeded their expectations as did the amount raised which was £5,581.29 for The Children's Foundation. The fund raising isn't finished for Running Blind in 2017 and they have plans to raise funds for local blind children's charity, Useful Vision for the rest of this year. I'm pleased to report that all runners managed to safely complete the 13.1 miles of the Great North Run safely. The majority of the team made it to the The Children's Foundation tent at the end of the run. Thank you to Andrew Skelton (pictured top left below) from my sponsor SOS Group Ltd for handing out the special Team Run Geordie Run goodie bags to the runners. 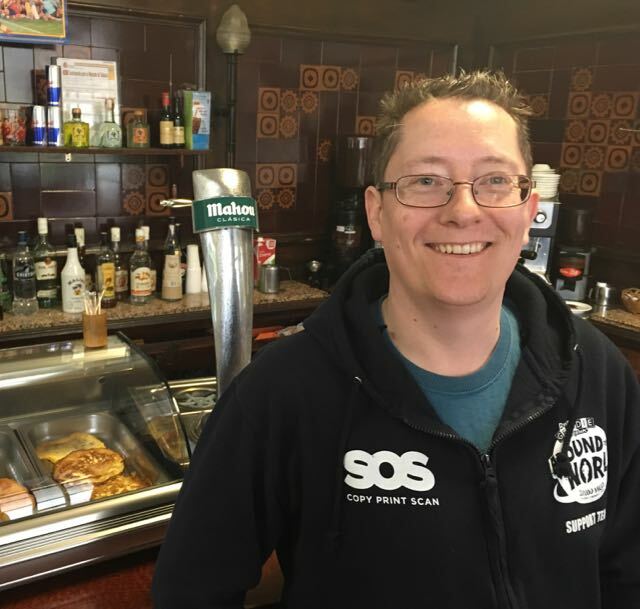 Thanks also to SOS for paying for the runner's vests and t-shirts. 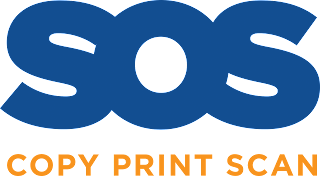 This is the 3rd year that SOS have supported Team Run Geordie Run and it's really nice to be able to provide a goodie bag at the end as well as the smart running attire. At the time of writing £14,513.62 has been raised for The Children's Foundation by Team Run Geordie Run. There is still money to be collected and the final total could be as high as £17,000. That is a magnificent amount indeed and the total raised for local good causes by Team Run Geordie Run over recent years is now over £35,000. Thank you to Gary Cowell, Steve Dobby, Carlton Fletcher, Richard Garman, David Gateshill, Richard Handley, Kelly Hannah, Matt Janson, Alexandra Jarvis, Alastair McLeod, Jonathan Hornby, Michael Dunn, Simon Kelly, Ivan Newton, Chris O'Callaghan, Connie Oldham, Lyn Rose, David Rowe, Chris Soulsby, Russ Stobbs, Alan Stoddart, Fiona Williams, John Wood, Andrew Ferguson and young Archie and Owen for all they have done for The Children's Foundation on Team Run Geordie Run in 2017. 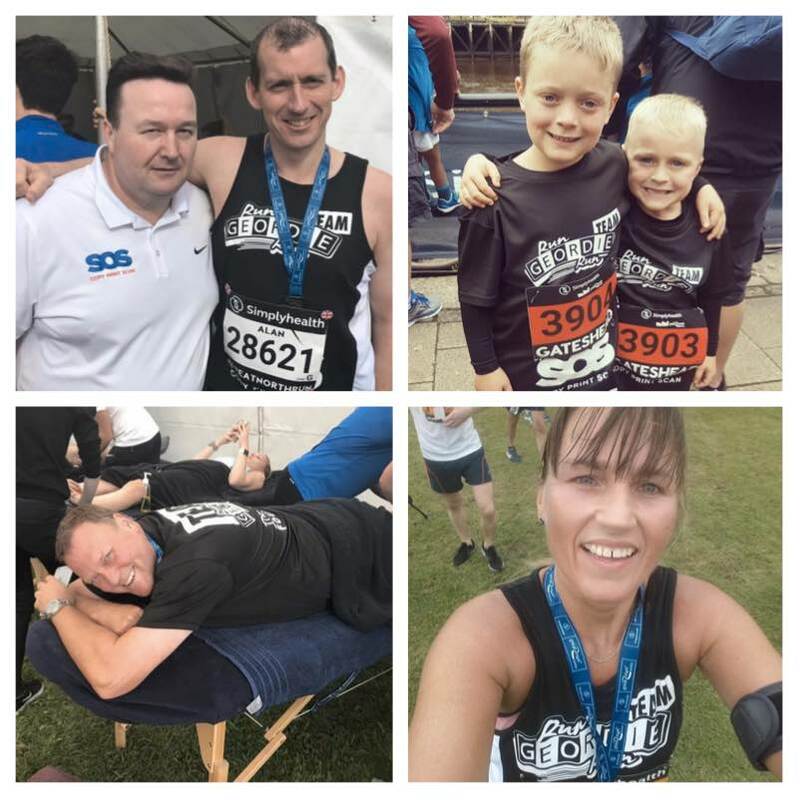 Run Geordie Run t-shirts have raised almost £30,000 over the years for local charities such as St Benedict's Hospice, The Children's Foundation and The Sir Bobby Robson Foundation. We are currently working on a new design to be produced in August. When I say "we" I'm very excited and proud to say that I mean the children that attend the skills workshops ran by Useful Vision. 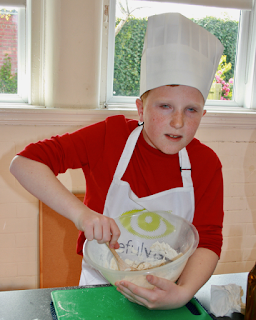 The Useful Vision skills workshops are held monthly for vision impaired children aged 10 and over. During the sessions children are able to make new friends, learn new skills, increase their confidence and gain more independence. They have the opportunity to take part in various introductory taster sessions and team building exercises. Children can take ownership of projects and be involved in planning activities. At a recent skills workshop I set the children the task of coming up with a running related t-shirt design that was limited to two colours. The outcome of the was this very snazzy "run the race" design. The front of the t-shirt has both the Useful Vision and Run Geordie Run logos. On the back is a very nice image of children holding a "run the race" banner along with the Useful Vision mission statement. I'm sure you'll agree that it's a brilliant design and I'd like to say a huge thank you to the children and staff at Useful Vision for all of their efforts with this. Thanks must also go to Dave Shenton at Shenton Creative who converted the children's design into a format ready for the printer to use. An absolutely massive thank you goes to my sponsor Fresh Freight Group who will be paying all production costs. In time honoured tradition this means that every penny that the t-shirts raise will go directly to Useful Vision. The t-shirts will go on sale for £12 meaning that the full £12 goes to Useful Vision. This is the approach that has always been taken with Run Geordie Run t-shirts. 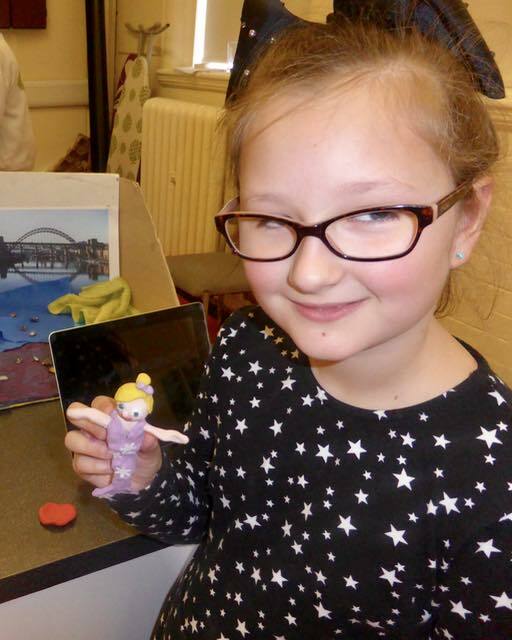 I think the fact that the children have produced something that is going to benefit themselves and other children that use the charity's services is nothing short of wonderful. If you would like to order a t-shirt then please follow the instructions in the order form below. T-Shirts will be posted after 14th August. More by accident than design my training for each segment for the run around the world has seen me revisit old ground. For the run across the USA in 2011 I did a lot of training on the North Pennines which was part of my 2007 John O'Groats to Lands End route. For the run across Australia in 2013 I went back to the USA to train. The heat of Death Valley in September 2012 was ideal preparation for those scorching hot temperatures in the Outback. In preparation for the run across Europe in 2016 I went back to Australia at the height of their summer. With a little over 280 days left before the next leg of the run around the world gets underway (Belgrade to Astana) I've found myself back in Europe. 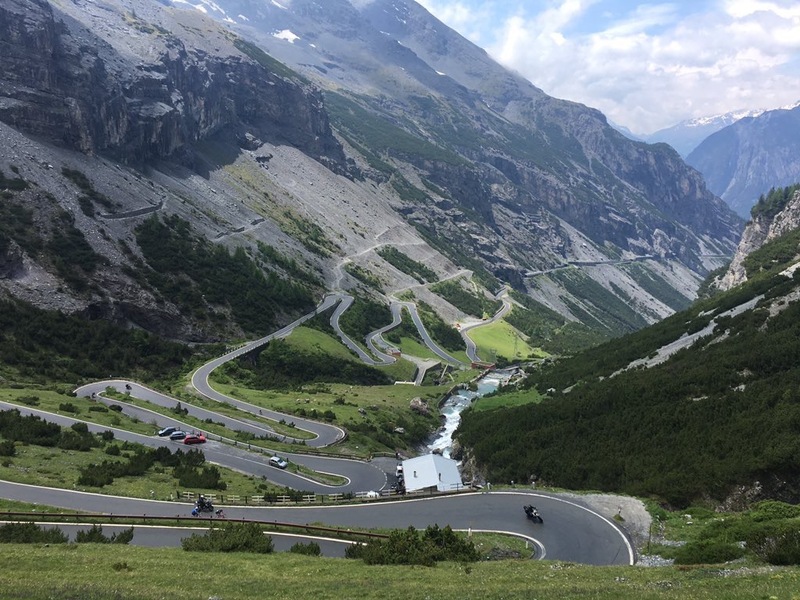 On Thursday 20th July, I'll be returning to the Stelvio Pass in Italy for a training run. I ran up and over the Stelvio Pass on day 61 last year. It was one of the toughest climbs of the entire tour. This time, I'll be running in the opposite direction from Agumes to Bormio. It's about 28 miles. I'll be running up this side and it's many switchbacks. I remember being glad that I was running down it last year. I never thought that I'd get the chance to run up it. 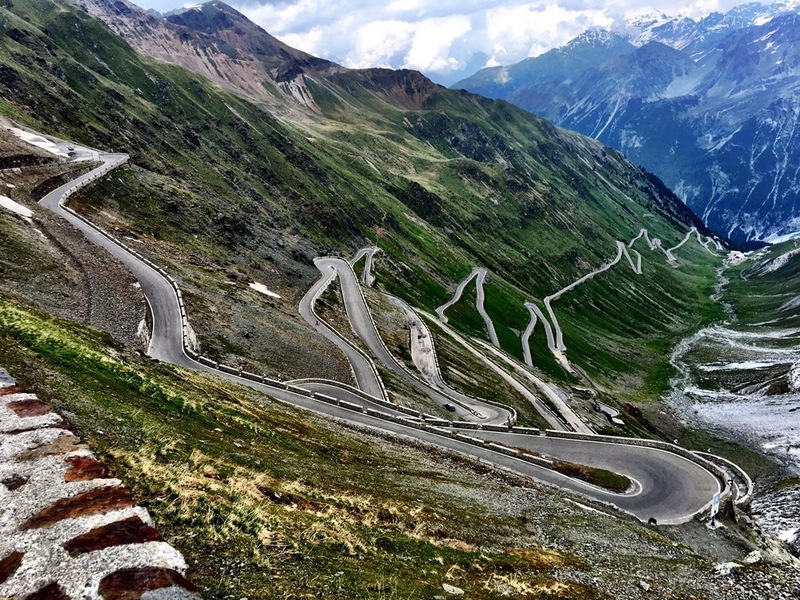 Once at the summit of the Stelvio pass there's a huge open valley before I reach the section below. This part is quite tricky with a few tunnels. Hopefully, the traffic will be quieter when I reach there later in the day. The images below were generated from my GPS watch last year. So I'll be starting from the right hand side this time. If your company would like to sponsor this XXXXXX Stelvio Challenge (where XXXXXX is your company name) then please get in touch at sponsorship@rungeordierun.com. All proceeds will go to charity Useful Vision. The current highest bid is £300. Bidding closes at 9pm on the 19/07/17. In return, there'll be plenty of mentions and credit given on my social media feeds. 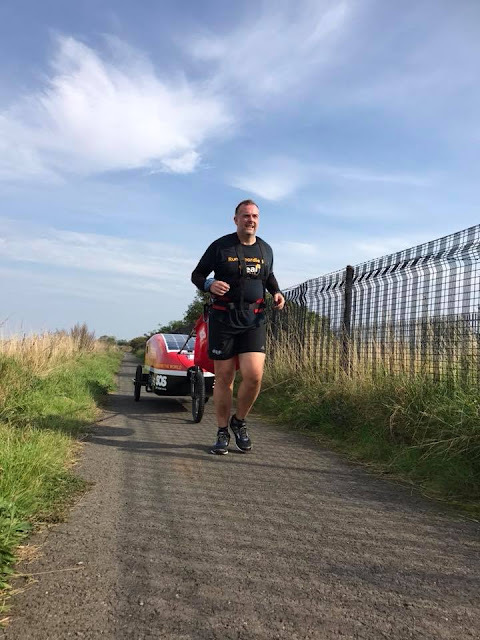 My training is really starting to ramp up as I continue my preparations for the 2,900 mile run from Belgrade, Serbia to Astana, Kazakhstan starting in just over 300 days time. It's now the right time to really push myself and revisit an old training ground; The Borders. I first had the idea of running from Edinburgh to Newcastle back in 2010 while training for the 3,100 mile run across the USA. 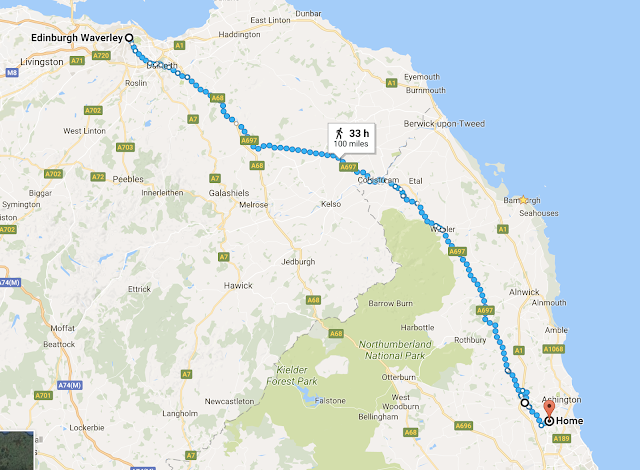 The route back then involved running just over 100 miles with overnight stops in B and Bs in Melrose and Otterburn. The undulating route covering up to 37 miles per day over 3 days on busy main roads has been instrumental in my training for the run across the USA and subsequently Australia and Europe too. I've always managed to get a very generous sponsor for this particular training exercise with all funds going to charity. They've usually been unusual and unexpected sponsors too with round the world cyclist Mark Beaumont and Northumberland Tea among the previous sponsors. I'm very pleased to announce that another organisation has kindly responded to my request for sponsorship. This weekend's 100 mile run from Edinburgh to Morpeth will now be known as the Newcastle Diamonds Border Challenge. All proceeds from the event will go to Useful Vision who do some brilliant work with vision impaired children in the region. Followers of my Facebook and Twitter feeds will be aware that, since I finished the run across Europe, I've been a regular at Brough Park. 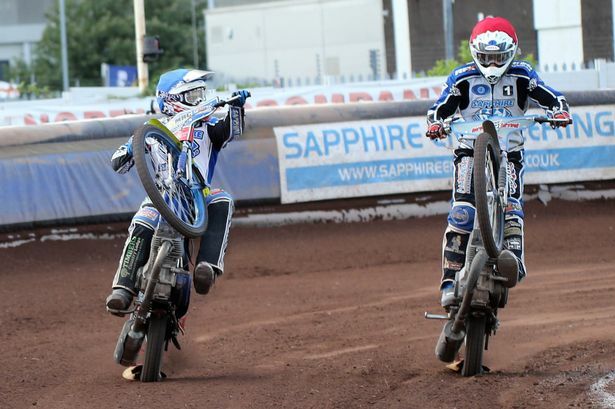 That is, of course, home of the Newcastle Sapphire Engineering Diamonds speedway team. I originally went thanks to winning some tickets in a charity raffle. I was immediately hooked (as I was with Newcastle United in the 1980s) and have spent most Sunday evenings since cheering on the team. 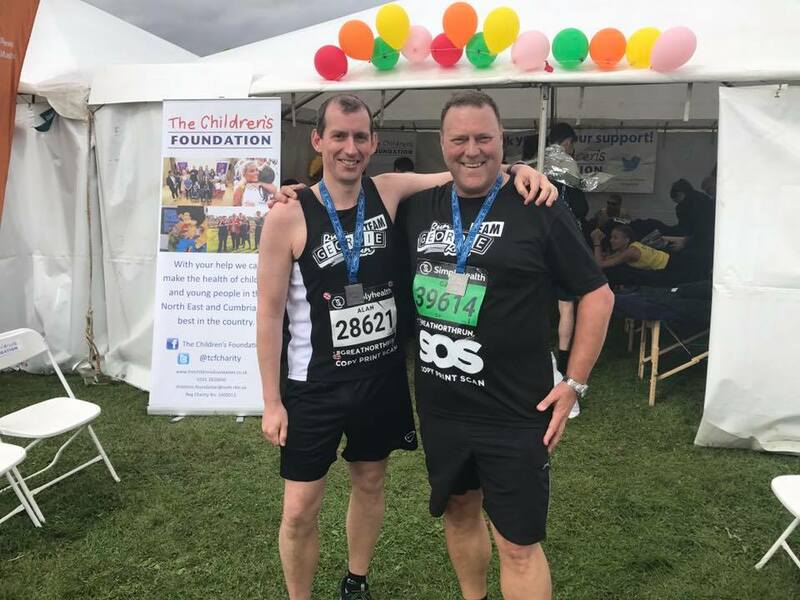 So it's a huge thank you to the team and management of Newcastle Sapphire Engineering Diamonds for their brilliant backing of this weekend's very tough training run and of their very kind donation to Useful Vision. The fact that there is charity money at stake gives the Newcastle Diamonds Border Challenge a real edge. After my 0620 train from Morpeth gets in to Edinburgh Waverley on Friday morning I'll start running back to Morpeth. As you do. I'm very proud of the fact that this whole trip is costing £5.80 (plus train booking fee). 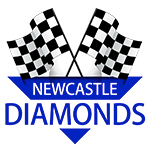 The Newcastle Diamonds Border Challenge is an unsupported distance of 100 miles and will take 2.5 days to complete. It was originally scheduled to take a full three days but the Diamonds are at home and it's tapes up at half past seven on Sunday! That will keep me on my toes. I'll be carrying everything that I need to eat, drink and sleep in as I run. The route is more easterly than usual and there will be more shops and garages than usual as I'll be consuming more water in 3 days than I can carry. There is also the small and unprecedented matter of sleeping rough on Friday and Saturday night. That should be very interesting as I don't like the dark. The image below is kind of how I see those night's sleep going. As an added bonus there is also my sponsor D-Line's cash for miles scheme that is in operation in June. Every mile that I run this month will see them donate £2 to Useful Vision. So far, £116 has been raised. The 100 miles run on the Newcastle Diamonds Border Challenge will get that figure over £300. All in all it promises to be a good fundraising month. So finally, thanks again to Newcastle Sapphire Engineering Diamonds for their brilliant support. Please keep a look out on my Twitter and Facebook pages for my progress on the Newcastle Diamonds Border Challenge. They are all at it now! My sponsors that is with some superb incentive based sponsorship schemes designed to help me train and eat better as I prepare for the next segment of the Run Around The World starting in Belgrade in May 2018 and finishing 2900 miles and 100 days later in Astana, Kazakhstan. There's already £1000 in the bag for Useful Vision from SOS Group and another £1000 up for grabs should I shed another 10 pounds of fat weight by 13th June. This time it's a huge thank you to the sponsor of this blog, D-Line Cable Management, for setting me a huge challenge to be undertaken in June. D-Line Cable Management's challenge is simple in concept but is going to be very difficult to achieve in terms of getting the most money possible for Useful Vision, my chosen charity for 2017. The challenge is to run as many miles as possible in June and in return D-Line Cable Management will donate £2 for each mile ran. So the question is, just how much money can I possibly raise as part of this scheme? My personal record for the further distance ran in a calendar month is 1,069 miles. That was set exactly a year ago during the run across Europe. It was the section from Lisbon to Andorra which included some huge climbs in the Pyrenees. I've never managed more than 158 miles in a calendar month in training. That personal record was set back in September 2009. Given those previous distances ran I wonder that with a full time job and family commitments if it is beyond me to run 300 miles in June. That would see a £600 donation from D-Line Cable Management to Useful Vision which would be brilliant. Whatever distance I manage to run in June, a huge thank you must go to D-Line Cable Management for their continued brilliant support. Follow the progress on the Run Geordie Run Facebook page to see how I get on in June.